Ahh, let's just curl up and hibernate until Spring gently rouses us from our slumber... hold your reindeers, parents! Winter weather doesn't have to freeze playtime. It's magical and lovely out there, so why not bundle up and enjoy it with the kiddos? There's oodles of family fun to be had around the holidays and a winter wonderland of play possibilities awaits outside! If you're blessed (or cursed, depending on your outlook) to live in an area blanketed with snow, I've got some kid-approved ideas on how to have flurries of fun! There are tried and true rosy-cheeked adventures such as building a snowfamily or catapulting snowballs, but let's get creative! Play is a fantastic way to banish the winter blues, bond as a family, and discover the joy in all seasons. Plus, who doesn't love coming in from the cold to a steamy mug of hot chocolate? Here are 15 ways to play in a Winter Wonderland. Hula Hooping: Hula hooping is lively fun no matter the weather. Now imagine the extra challenge of keeping it floating while all bundled up! Cue laughter! Plus, you can lay them down for an impromptu game of snowball toss. Get Artistic: How about some snow graffiti? Fill spray bottles with water and food coloring and let the kids work magic on the fluffy white canvas! My girls absolutely adore this and were delighted by their first attempt. If you try it, pictures please! Snow Castles: Do you miss the beach? Me too! As we long for sunny sand, let's break out the sandcastle molds. Your kids can nurture their inner architect by building from hard and packable snow. Build a Fort: If your family is to ever stand a chance against the neighborhood onslaught of snowball warfare, you need to build a snow fort. The more snow, the more gloriously cavernous it can be. Snow forts are also perfect for hide-and-seek! Pin the Carrot on the... Snowman? : I LOVE this idea! Borrow Mr. Snowman's scarf for a blindfold and ready your carrot for this twist on the classic game. Just be warned that your beloved snowman may end up with a big orange growth anywhere BUT his face! Go Sledding: This is a winter rite of passage! Soar down the slopes, conduct races for your kids, or arrange obstacle cources with cones. If your kids are a bit older, you can help construct jumps out of snow to achieve some air. After all, excitement and healthy risk benefits kids in several key ways. Snowball Fights: Warm up those pitching arms! There are intricate gizmos and gadgets that formulate the perfect snowball, but our hands do just fine. Just be sure to remind your kids to never throw ice or aim at the face. Artic Hunt: Scavenger hunts in the snow? Now that's dashing! Your kiddos will adore the challenge of digging through the snow in search of treasure. You could even provide those sand excavation toys I mentioned earlier. I love puns, so I use "warmer, colder" clues to guide my snow angels. Crazy Footprint Tag: When playing tag in the snow, it's crucial to follow in the footsteps of the greats. Really! Declare a new rule: when chasing a target, you may only step in the footprints they leave behind. The hopping, tiptoeing, swerving, rolling, and leaping over obstacles make for a thrilling game! The more movement, the merrier! Exotic Snow Creations: The snow is your muse! 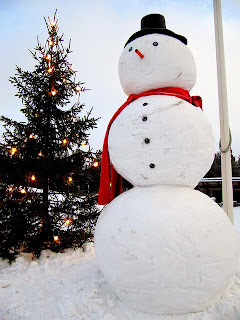 Break beyond the mold of a simple snowman. You can make animals, objects, self-portraits, and the next world wonder! Found objects make dazzling decorations, too. Snow Angels: Who doesn't love making snow angels? So whimscal and relaxing! Spice it up by painting on dresses with the food coloring spray paint. Channel Elsa: Spritz a piece of black construction paper with water and pop it in the freezer until it's frozen. A thin layer of ice crystals will blossom across it like magic! Offer your kids magnifying glasses so they can marvel at the crystalline landscape. You can also catch freshly fallen snowflakes and encourage your kids to try identifying them with a handy chart. Ice Bubbles: Did you know that if you blow bubbles when it's below 32 degrees out, the bubbles can freeze in the wind? My girls just love the irredescient baubles! Take Decorating Further: Parade the festivities outside! Do your kids have a beloved playhouse, playground piece, or background area? Invite them to decorate with lights, homemade decorations, and whatever else they dream up. Let it be their project! Stick-Stack-Snow: Simple and classic! Carve a square board out of the snow and use twigs as X's and rocks as O's. To encourage more playful movement, you can make the board HUGE! I hope you enjoy these 15 ways to get out there and play with the fam! Do you have any more suggestions? I'd LOVE to hear them! Let us know in the comments section!